This is a "Blast" from WAY back. 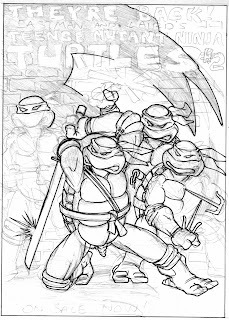 I started -- but obviously never finished -- this ad for the second issue of TMNT Volume 1. Thinking back, this was probably done during that period of about a year when I was living in Connecticut, coordinating all of the printing and shipping activities and dealing with the distributors. Kevin at that time was still living in Maine, and we were doing the artwork together through the mail. It's funny... the art is so clean and professional looking, but the lettering in the background looks like it was done by a completely different person! But that's okay... lettering isn't important anyway (don't tell Steve Lavigne or Eric Talbot that I said that). -->> after this am i the only one ' craving ' that HINGE JAWED ' MOUSER ' NECA figure now ?? I'm craving Shredder, and to a lesser extent, April. But I am curious to see how different this mouser will be from the SDCC exlusive. -->> lol , Daniel ..
That's something to display at, oh, say...Comic-Con this year. MOUSERS? Do you think we'll ever see hinged-jaw mousers, tOk? Back to the pic-- a lot of this stuff would be sweet in a sort of slide-show presentation for the 25th anniversary. when i came back from San Diego after talking with Randy .. i was confident about the future of the NECA line. Economy troubles, NECA's lack of communication, me partially caving into the pessimism of the masses, and NECA's distribution/ manufacture problems they've had with various companies overseas the past number of years .. .. i was having my doubt. But recent revelations and Gary's announcement here to Pete days ago has brought all that reassurance back !! Like i was saying in the first place way back in freekin' AUGUST on '08..
we just gotta have patience. Neca is not the scale of company as Mattel , Hasbro, or Playmates..
so their challenges are much steeper.